So I was teaching the Improve your Search Engine Rankings today and rather embarrassingly showed my blog (to illustrate the difference of landing on a “home” page versus a latest posts page) and realized I’ve not updated for a month. How on earth did that happen? I’ve been getting my head down and building my Younique Business for the last five weeks! I’ve spent time blogging about that already on the Glatitude site – so no point repeating it too much here – but will recap just a little of what’s going on (See My Week in Younique – a new weekly feature for more details). I signed up with them at the end of October, and began selling when we launched in the UK November 1. Got a few orders fairly fast and I qualified as “White status”. 18 days later got my first team mate then quickly got another and another…There are six on my team currently (one may be quitting) and two others who have been recruited by my team. That makes 8 in my company overall. Well, 9 if you include me. By the end of November I’d reached “Yellow” so got a pay bump from 20% to 25%. Forever. (Yippeee). Sadly, I missed “Pink” status by a few hundred in November, so my stats reset on December 1st to $0 and I had to start all over again! I was bummed if I am being honest with you. I really wanted to whip out the credit card and self-fund Pink but that defeats the point in running your own business (if you’re your own biggest customer). Thankfully the month of December (5 days in now) has been good for both myself and my team – so I am quite close to achieving “Pink” already (yippeee again). The brilliant thing about Pink is that I get a % of my first level’s sales on top of my own 25%! Are you following all this? It’s not the easiest compensation plan to wrap your head around. I have had to watch many videos to “get it” but I think I have got it – at least until Pink…Don’t ask me about the rest of the rainbow just yet. There’s one other thing – I believe I am just ONE order away from hitting Fast Start. What is it? It’s another milestone with Younique. Once this is achieved, you will be sent a Fast Start Charm, and 250.00/US, 300.00/CAD, 325.00/AUS, 350.00/NZ Younique Cash automatically added to your Back Office. It’s been a profitable day today. I woke up and I’d made money while I slept (which as you may know is my main aim for all of this). Incidentally as I was writing this blog post, our weekly Younique update has just come in, and we have our very first millionaire in the company…Shari Brown is her name (A fellow Cali gal) and she’s had to earn $83,333.33 in a single month to qualify as “millionaire status”. What an inspiration! Remember it’s only a two year old company. That’s incredible isn’t it? Another reason why I am loving this! 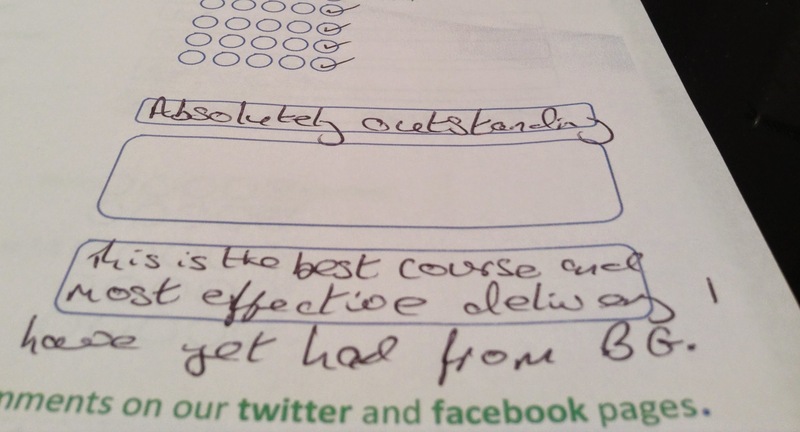 So today’s Business Gateway course went pretty well. It was SEO – my fave. The room was filled with a fabulous bunch of SMEs and most seemed to enjoy it! just one more Business Gateway training session for 2014. Can’t believe it’s over. Thankfully the 2015 diary already has dates booked in. This final quarter of the year has made me re-evaluate my career plan. I actually felt pretty burned out on social media. In 2015 my aim is to still do some social media training – but to focus on my own Younique team rather than do as much as I’ve done for other sources this year. Generally speaking, it’s been a pleasure teaching – Facebook, Twitter, Linkedin, Blogging, Youtube, and the e-business courses all over Scotland (from Ayr to Oban) – but some days were more challenging that I’d have liked. Because these courses can have a range of students from absolute luddites or newbies to more advanced marketers – it was often a challenge to pitch it right! On the same day as the feedback pictured above I also had the worst feedback I’ve ever had. So on days like those, when the audience was so diverse, I’d leave feeling more than a little deflated.